Home Domestic News Premier League Which end of the table are you watching? With the end of the season nearly upon us, we might be forgiven, that we normally start to get excited over the transfer window nearly upon us, but for the last two seasons at least, we have always had last minute dilemmas in deciding the title and whose for the drop, with this season being no different! Chelsea’s win over Liverpool at the weekend the title race at the top has blown wide open in Manchester City’s favour! Being only 3pts behind and a game in hand and a better goal difference, Pellegrini might be excused for a wry smile every now and again. For the first time in a long time Liverpool might be excused for looking over their shoulder, as Chelsea parked a two tier bus in true Mourinho style. Chelsea now have to face out of form and relegation favourites Norwich, then away to relegation candidates Cardiff on the last day. Manchester City have to face what were 4th place favourites Everton until Southampton accordingly knocked them out of that race at the weekend without scoring any goals, and then home to Villa in a mid week game, then finally home to West Ham, knowing if they win all three games they have effectively got the title with goal difference as the decider unless SaS come up trumps! Liverpool now with Sturridge back and reeling after the sunday defeat by a very rare Gerrard mistake, have to go to Tony Pulis side Palace and get a result against a dogged side thats wrestled themselves out of the relegation fight. They then host a very out of form Newcastle side who have just lost 3-0 to Arsenal, who are favourites now for the 4th spot. And if thats not enough Liverpool have to turn over the 8 goal deficit to Manchester City and score more than them in the last two games! Advantage City! Now to the bottom of the table! With only two points separating the bottom four and 5 pts the bottom five, this really is do or die for some clubs and a potential £25m black hole, which increases to £33m if they fail to win immediate promotion back. Norwich have to be favourites to go down, having to face both Chelsea and Arsenal in their final two games. Its hard to see which of these they will, if any, get any points from. Yet, they can influence everything at the top if they take points away from both Arsenal and Chelsea and particularly bringing Everton back into play for that 4th spot, but thats not what Hull City will be wanting! Hull will qualify for Europe for the first time in their history, even if they lose the FA Cup Final to Arsenal, if Arsene Wenger’s side qualify for the Champions League! Its a tough call but thats why we love football! Fulham have a better chance of escape but will have to pick up vital points from Stoke City, and Palace. Bottom placed Cardiff will also have to pull off a miracle and get points from Chelsea and Newcastle to stave off relegation but again they could affect whats happening in the top half. With both Cardiff and Norwich having to face Chelsea its these three teams who have the toughest call in the last two games of the season and like always this could go right down to the wire and I mean injury time! Villa and Sunderland both have a game in hand, and if they make these count they could ensure their Premier League survival. Villa have three tough games at Home to Hull and away to Spurs and Manchester City, again could be affecting their title chances. Sunderland again three tough games, away to Manchester United but two home games to WBA and Swansea. Its difficult to see where they will pick points up, if they don’t they could be dragged right into the mire if the bottom three start picking vital points up in their games. 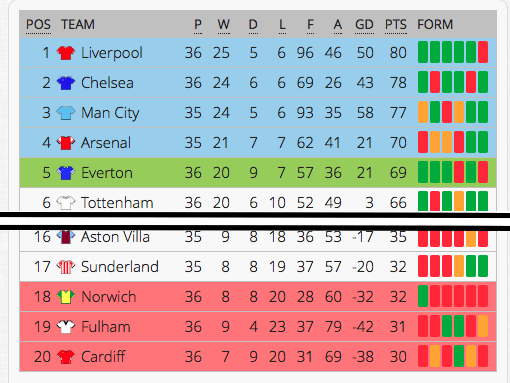 How will it end is difficult to see at the moment, but I don’t fancy both Cardiff or Norwich’s chances this season. In terms of the title I would like to see Liverpool lift it, but they will need to get that formula striking partnership back up to speed in Suarez and Sturridge and they will need to steal 8+ goals from somewhere if City win all of their games! So whose your favourite for the title or drop? Manchester City are now favourites at 5/6 with Ladbrokes, Liverpool 11/8 BetVictor, Chelsea 16/1 with Sporting Bet. Next articleSwindon Town terminate Nile Ranger contract.